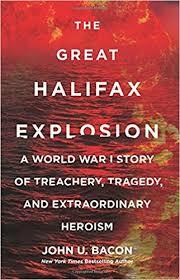 The Great Halifax Explosion by John U. Bacon was an interesting historical read on the December 16, 1917 calamity in Halifax, Nova Scotia that killed 2,000, wounded another 9,000, and left 25,000 homeless as the result of the most powerful man-made explosion until Hiroshima decades later. Bacon tells the story of The Mont-Blanc freighter in New York getting packed full of explosives to be used in WWI, then heading to Halifax before the planned trip across the Atlantic and colliding in the harbor with another ship, the Imo. It was interesting reading of the choices people made, going towards disaster or fleeing it, with the crew of The Mont-Blanc abandoning in the harbor their burning ship, knowing it would explode, but not warning people, juxtaposed with the story of train dispatcher Vincent Coleman seeing the burning ammunition ship and telling co-workers to flee, while staying to send a telegram warning away an incoming train. Noted in the book was that the explosion 83 million times more powerful than a gun being fired, with subsequent ground waves causing shaking 110 miles away, followed by even more destructive air waves, or shock waves, gas bubbles racing outwards destroying things in it's path. The explosion killed roughly 1,600 people instantly, and in it's aftermath, people and communities rushed to assist, with one outcome of the disaster the strengthening of ties between the United States and Canada, with specific mention made in the book of Boston's contributions and how there's every year a Christmas tree delivered from Nova Scotia to Massachusetts in thanks, a tradition from shortly after the explosion that restarted in 1976 and has occurred annually since.